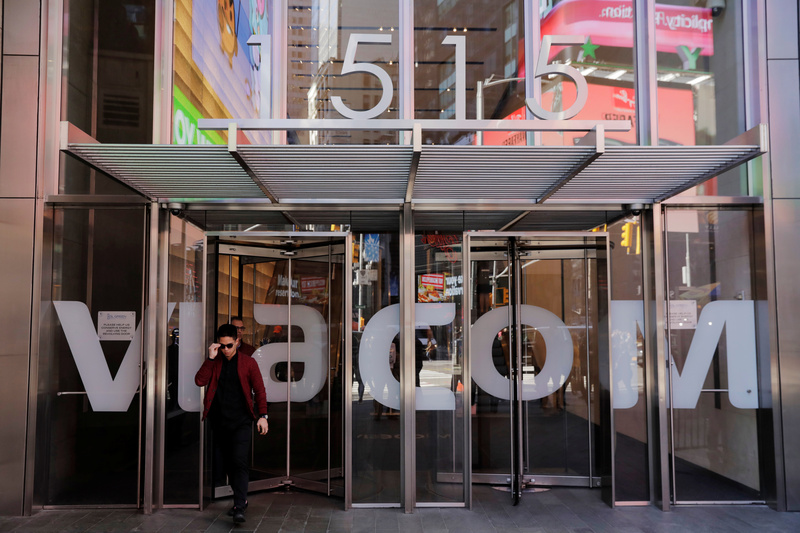 The Viacom logo is displayed on the doors of a building in midtown Manhattan in New York, U.S., February 27, 2018. Shari Redstone, whose family investment-holding group is the controlling shareholder of both CBS and Viacom, is considering a combination of the two companies without CBS Chief Executive Leslie Moonves, Reuters reported on April 11, citing people familiar with the matter. CBS informally made a bid for Viacom at a below-market price with the condition that Moonves ran the combined company with his preferred management team. Redstone would like Viacom Chief Executive Bob Bakish to be named the No. 2 at a merged group, according to Reuters. CBS released its proxy statement on April 6 in preparation for its annual meeting, scheduled for May 18. There are 14 nominees for the board, including one new candidate, former Time Warner boss Richard Parsons. Parsons would replace Arnold Kopelson, who is not standing for re-election. Ten of the nominees, including Parsons, are 70 years old or above. Nearly 80 percent of the nominees, including Redstone, have served on the board for more than a decade.